Recently, the Sonoma County Tourism Board in California chose me to be one of the next faces of Sonoma County and I was beyond thrilled to be representing the beautiful county that I call home. 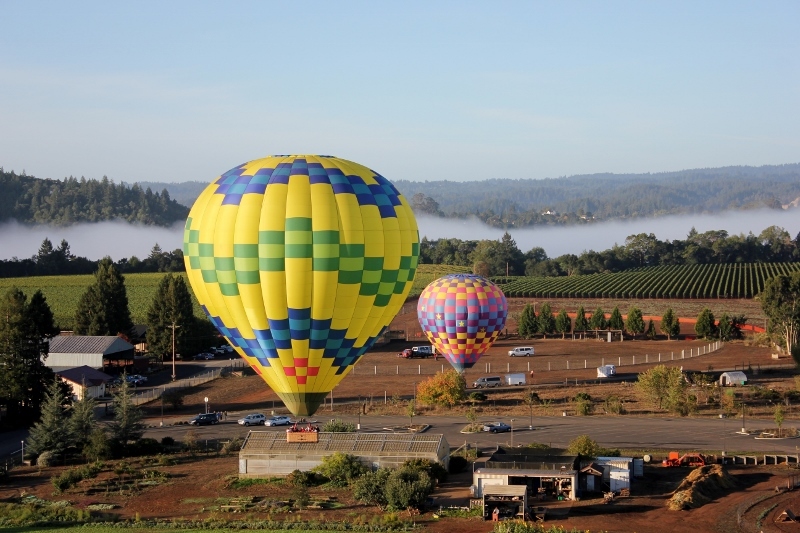 And that was way before knowing that one of the perks to being a representative (aka: a Sonomad) was a hot air balloon ride over the picturesque vineyards of Northern California. Lucky Day. A hot air balloon ride had been on my bucket list for an unacceptable amount of time and was begging for a check. At the unlucky morning hour of 4:30, I awoke sleepy-eyed, yet ready for the adventure that awaited. Truth be told, there are limited reasons why I would get out of bed at this time in the morning. Very limited. One being an early flight to an exotic location, which I still try to avoid at all costs and the other is to yell “shut up” to the neighbors after they have been drinking all night and wanting to have that “you don’t really love me” relationship battle in front of my bedroom window at the wee hours of the morning. I am not at all bitter about that. 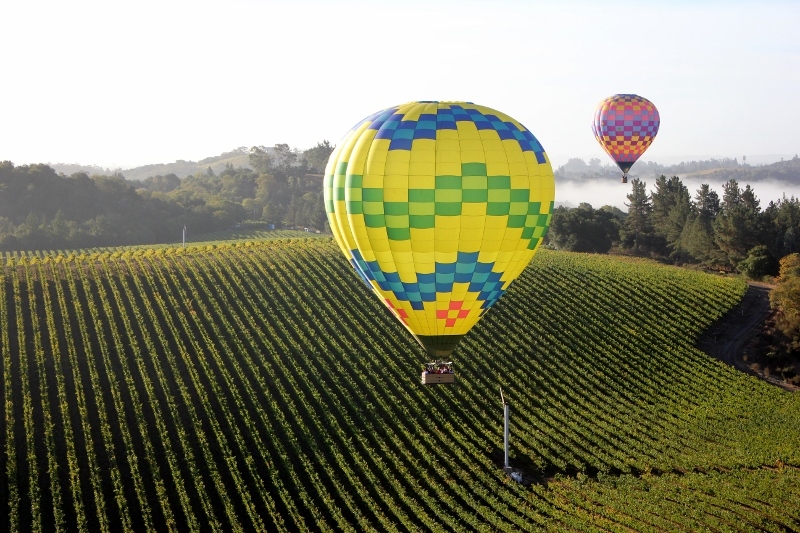 But, I will make an exception for the absurd hour of this wake-up call for a Hot Air Balloon Ride over Sonoma County. I may have even been a little bit chipper. As chipper as four a.m. gets. We met at the airport, where our balloon company, Up & Away drove us to the take-off location. 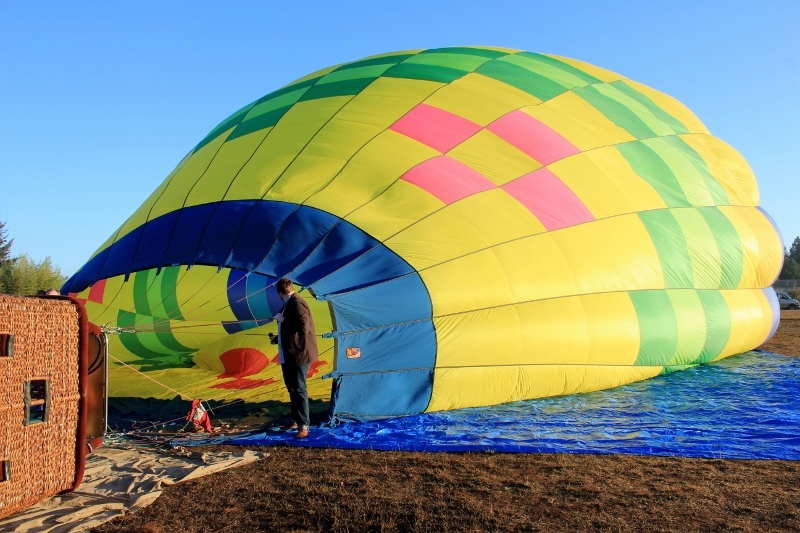 The guests would be in charge of inflating this colorful, soon-to-be mode of transportation and with little effort two people held the opening of the hole. First, cold air was blown into the flat bag, then hot air from the burners finished it off, possibly taking some eyebrows with it. 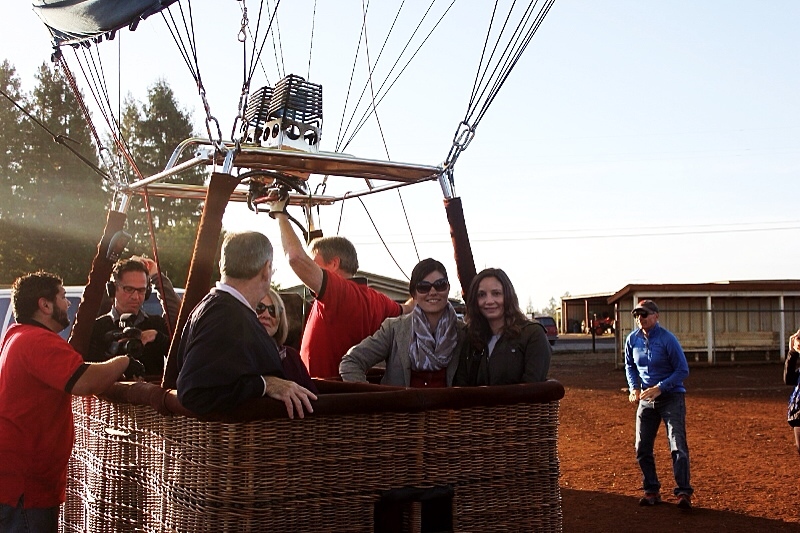 When the hot air balloon was was full, we loaded up: the camera crew, pilot and six Sonomads. The flame propelled us into the air and we began traveling at a fairly slow pace. This may have been the reason why this ride was not as frightening for me as flying in an airplane. That, plus the fact that I could see the pilot right in front of me navigating this flight. I was ready to poke his eyeballs out if he made one wrong move. He’s lucky he didn’t. In the beginning, the Sonoma county fog had yet to burn, but that just added to the ambiance. The wind took us traveling in an undesignated direction and led us to reach an elevation 8,000 feet. 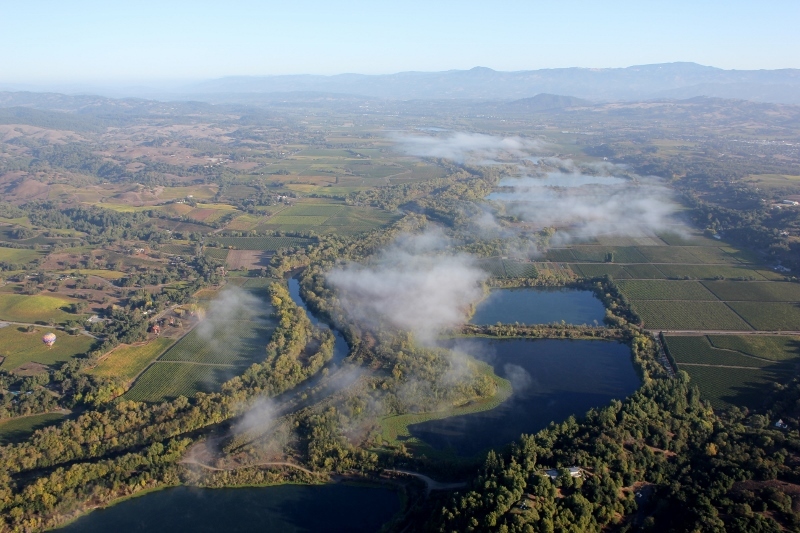 We flew high over lush green farmland, rustic barns and the vineyards that were famous in Northern California. When we reached a large pond, the pilot wanted to show us his skill. Be careful, my eye-poking out threat still stands. As we flew over the middle of the waters, we began to descend. Not rapidly, but still downward. The captain then proved how much control he had as he dipped the basket just a couple inches into the water. There will be no eye-poking. After an hour in the air, we landed just as easy as we had ascended and Up & Away had a brunch, complete with mimosas waiting for us. Cocktails are the perfect ending to a perfect morning. This experience turned out to be a great addition to my list of the top things to do before you die. 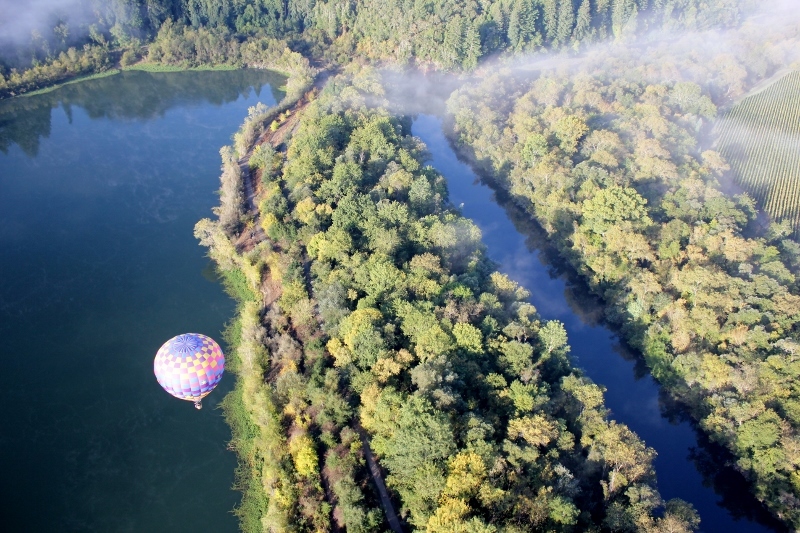 Have you ever taken a ride in a hot air balloon? If not, will you add it to your bucket list? Beautiful shots Annette! I’d love to ride in a balloon one day despite the face the idea frightens me a bit. I have it on my bucket list for someday when I visit Cappadocia in Turkey. It wasn’t as scary as I thought I’d be. Thankfully! I would definitely do it again in Cappadocia! I would love to do this one day too. Maybe for a special anniversary? The photos are beautiful! I had always that my first time would be for an anniversary. That would definitely be memorable! Best of luck with your list! Looks like it was totally worth the early wake up call! That looks like so much fun! I had the opportunity to spend my 40th birthday in a hot air balloon. Loved it but I think the scenery of NoCal definitely is prettier than Houston, Texas. What a memorable way to spend your 40th! mug we now use at brunch, and another on my new business card. Hope you come see us again someday. Great post and I love the photos. My favorite hot air balloon flight was over the Masai Mara in Kenya. I bet that was a beautiful balloon ride! A hot air balloon ride is definitely on my bucket list. I am hoping to check that off my list in Capocaccia Turkey! Capocaccia would be a beautiful place to ride in a hot air balloon! Wow. . . I just love those stunning sky view images of California. 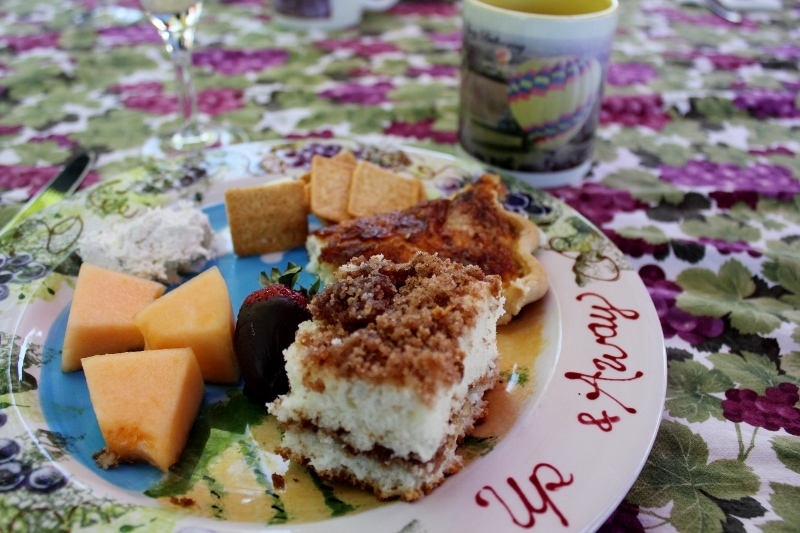 I have been to San Francisco once and visited a wine yard in nearest rural area and it was really a great experience. You images and article proves that it is really very lovely to see it from top as well. I would love to do it on my next trip. Yes! The Albuquerque festival is supposed to be absolutely stunning. 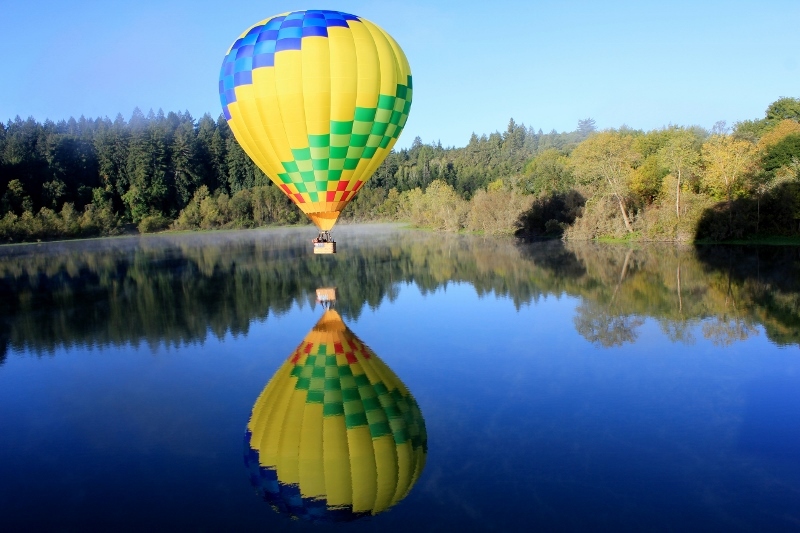 Thanks for sharing your hot balloon experience with all of us. Hot air ballooning is something I’ve always wanted to do. I love the picture with you over the water. It must have been exhilarating when the captain dipped the basket in the water.